Create, edit and test your own missions using an intuitive yet powerful interactive editor. 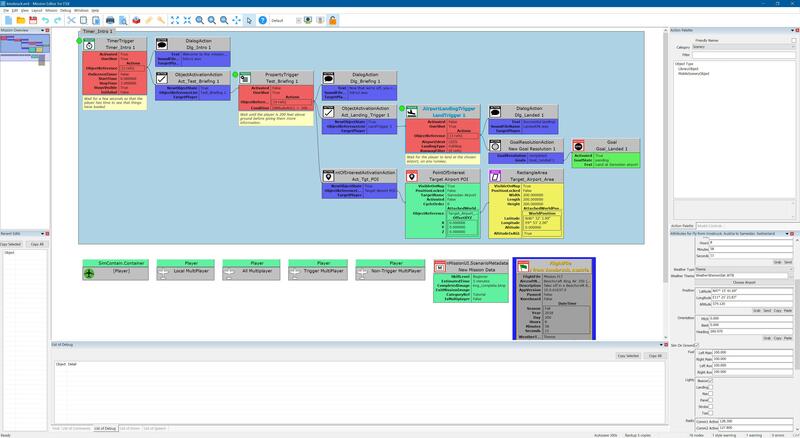 See your mission design as a flowchart with each type of action and trigger clearly marked. A standard drag-n-drop interface allows you to read and change your mission design far more easily than the standard Object Placement Tool. See an overview of the entire mission flow at any time. 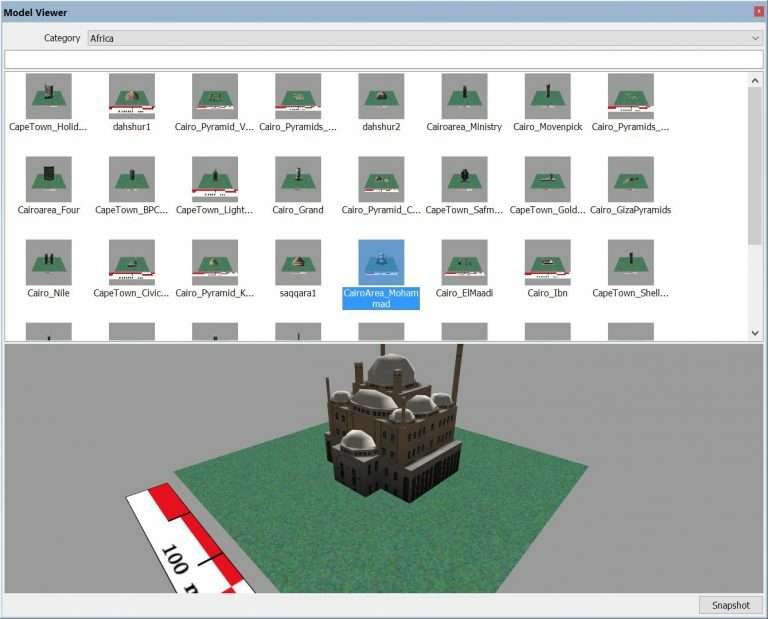 Unlike the standard tool, the Mission Editor predicts and displays all errors in the mission. These can very easily stop the mission from being loaded and, without any feedback from the simulator, it can be very difficult to find out what's wrong. Change the colours of individual actions and groups to clearly show which actions belong to which type of operation. A Mission Wizard gives you a helping hand to start out with your missions. Have it create either a point-to-point flight, or a more complex design based on a flight plan, and it will create an entire, flyable mission at the push of a button. Use the PC's speech synthesis capabilites to create recorded speech to use while you test your mission. This allows you to calculate timings and the 'feel' of the mission without having to record new dialog every time you change it. Build a standard Windows MSI installation package of your mission and all its dependent files. This makes it much easier to distribute the results of your work. You can also automatically build MSI patches to avoid having to send out unchanged elements such as artwork and recorded speech. The editor is FREE to try, with some limitations. Test it out, use the wizard, even write complete simple missions - just download and install! The new Mission Editor is an evolution of the original "FSX Mission Editor", combined with many of the ideas used in the Dovetail Games "Pro Mission Tool" for Flight Sim World. It allows you to easily design and test your own missions, leading you from simple beginnings to complex, evolving situations for fun, training or storytelling. The editor shows you clearly what the flow of the mission logic is while still allowing you to "re-flow" it to best fit your own understanding. Each action or trigger event is shown clearly, colour coded and labelled, with the resulting actions connected and obvious. Every feature of the simulator's mission system is made available, but you can get started without having to learn all the complexities. 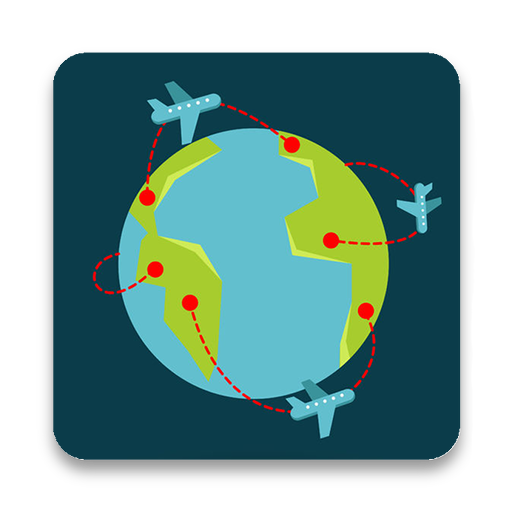 The Mission Wizard will build you a working mission from scratch, choosing from a simple point-to-point flight, or maybe loading a saved flight plan or even a flight recording. These simple starting points are perfect for learning the basics of mission-building, letting you see how things fit together before starting to make your own changes. The editor warns you about problems before loading the mission into the simulator preventing hours of frustration when your new mission simply doesn't appear in-game. Powerful tools show you where the errors lie and what they are saving time with trial-and-error editing. As you design more advanced missions you might start using the editor's built-in interactive debugger which will show you in real-time, as you fly the mission, what triggers are being activated. This makes the task of testing your missions much simpler than it might be, giving you the best chance of making high-quality content for others to enjoy. The author designed the original FSX Mission Editor as a Microsoft FSX beta tester, and worked extensively with Dovetail Games both on their "Pro Mission Tool" and on the simulator's mission system itself. This is a tool used by the pros. Bundled with the editor is a separate program which adds a number of useful commands to the simulator's mission system. Almost all of these commands were integrated into Dovetail Games' Flight Sim World, but if you want to use those features with FSX then this extension is the only way to achieve that. Fully integrated into the editor, the new commands are usable with the same simple drag-n-drop interface as the simulator's own native commands. The extension itself is freely redistributable with your missions allowing you to create richer, more complex scenarios and stories than with the base simulator.